In these tough economic conditions with tight marketing budgets, it is vital that directors in charge of digital business optimise their e-Performance by reducing their acquisition costs, perfecting their measuring solutions and improving the conversion of their processes. These projects require multiple resources (technical, strategic, human and financial expertise) which are both limited and costly to internalise, but to tackle them, the directors in charge of digital business have the possibility of working with partners so as to initiate swift and lasting solutions which allow greater gains to be made without spending more. Nearly 9 Internet users out of 10 undertake purchases on the Internet. Drawing from this, the challenge is to best exploit the digital ecosystem so as to convert the traffic into potential custom. The audit is the very first stage in optimising e-Performance. It enables one to access a mapping of the digital system identifying strengths, weaknesses and opportunities. Supplemented by a study of the competition, this system enables one to identify the threats as well. Once the business' internal and external digital environment has been diagnosed, the main areas for improvement can be defined in order to put into effect actions which are straightforward and inexpensive to implement, with an immediate benefit. Advertisers use several purchasing levers without necessarily knowing which one represents the best ROI. As a result, a crucial issue is to understand the impact of each one of the levers in relation to the others. This analysis, which is called ‘Multitouch’, provides a fresh vision of purchasing levers and of their degree of synergy and enables the ROI to be optimised by distributing one's budget more effectively. In France, the ‘online’ conversion rate is barely 1.5%2 on average, all sectors combined, whilst the ‘off line’ rate reaches the level of 55%3 ; more than 98% of captured traffic is therefore not converted on the Internet ! As for Internet sites in the United States, they achieve conversion rates exceeding 4%4. Granted, the consumer is more mature on that market, but this shows the room for improvement. In order to make his conversion rate grow, the advertiser must offer a user pathway which is better adapted to the needs of consumers. Certains iterative methods allow one to make profound improvements to the product and services offerings of a catalogue, to test the elasticity of a price, to optimise user pathways, the ergonomics of a page, the ‘wording’ of a label, the colour of a title, etc., in short, to work on the entire range of the parameters influencing conversion rates. The "A/B Testing" methodology, essentially based on Web analytics, can be used to measure the conversion. This approach involves using tools like Adobe Target or Google Analytics Content Experiments allowing one to test several creative strategies before applying the most effective one across the board. Gaining consumers' loyalty means personalising their experience (a loyal consumer costs five times less than a new customer and spends more5). The personalisation of content is a method which can be likened to a gesture of politeness. Imagine opening the door to a friend who comes to see you often and each time asking him to introduce himself again. Personalisation demonstrates to consumers the importance they represent to the business by the fact that they receive special treatment. In order to do this, using a multi-layer filter one collects, and analyses, "Big Data" data, so as to understand the environment of the consumer down to the smallest detail by obtaining very narrow segmentations : purchasing behaviour, geographical positioning, social networks, etc... Indeed, numerous businesses record a very large quantity of information on the behaviour of their customers so that each time the customers go on line the business can offer them a personalised content of products likely to be of interest to them. The costs of winning over new customers being high, the ROI of loyalty programmes is well established. If the entirety of the procedures described above is implemented, the loyalty programme (cash back, reward, etc.) represents the last link in an effective chain supporting e-Performance. 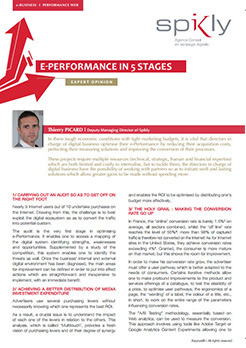 In conclusion, these 5 key stages are complementary and respond to the issues facing Marketing or Communication departments, Internet departments or General Management in terms of making rapid improvements to digital performance without that meaning increased expenditure. Thierry Picard is deputy Managing Director of the Spikly agency. With 15 years' experience managing internet projects, he notably made a name for himself in the Luxury and Press sectors in the posts of director of international e-commerce for the Hermès group and director of internet business for la Nouvelle République.